Musician Pat Boone, known for his conservative politics, delves into the presidential election on 'Larry King Now,' giving Larry his honest opinion on Trump's campaign. Larry King: I know you're very conservative, very political. Larry King: Isn't this race disturbing to you? Come on, Pat. 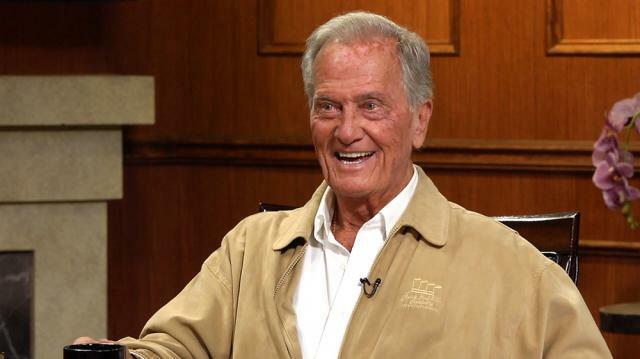 Pat Boone: I, Larry, I've written a couple columns for WorldNetDaily and NewsMax. And I'm quoting Mae West. First of all, you know, we're faced with two candidates that the majority of eligible voters don't like either one. And they're going to have to choose one or the other, or the independents, who can't win. So, I quote Mae West, I've never quoted Mae West before, but she said "When I have to choose between two evils. I like to go with the one I haven't tried yet." We've got two possible evils, I mean as far as many voters are concerned. One we know very, very well, after 30 years we know what she will do. The kind of judges she will appoint if she has that opportunity. Taxes and all the things. Larry King: But if you favor that, you should vote for her. Larry King: But Harry was a hell of a senator. Pat Boone: Oh, well, but he was not a president, or nobody thought of him. But then Roosevelt died, one of the great presidents of all time. And my parents were saying, "This haberdasher from Kansas City is our president! We're doomed! "Well, Harry Truman was blunt, sometimes profane. He did things against his counselors' advice. Including dropping the atomic bomb, firing the national hero McArthur because he was not respecting authority, and finally recognizing Israel, the new nation of Israel, which all of his advisers wanted him not to do. And remember little, Jacobson, I think was his name, was it Harry, or Ben Jacobson? Anyway, his partner in the store back in Kansas City came to see him and said, "Remember what the bible says? God loves Israel. You've got to represent, you've got to support Israel. And just behind closed doors Truman made that decision based on biblicaltruth. Larry King: Because of your feelings, and your strong Christian feelings, Donald Trump can't be your favorite kind of guy. Pat Boone: No, no. In fact, he knows it. I've talked to him, I've known him a long time. And I, I said to him during the nominating process, "Donald, if you would quit calling names, quit calling your opponents names. Get a tape of Reagan, when he was debating Mondale in the, and Jimmy Carter, he could state his case very firmly, sometimes with a little humor, but with respect for the opponent, and he seemed more likable and more presidential. I'll bet," and I said, "I bet your own wife is counseling you this way." And he laughed. He is impulsive. He's, when he's out there on the stump, people cheer him on and he says these improvident things. But he's also an executive and he knows what he doesn't know. And he's going to appoint people, if he's elected, who do know what he needs to know. Larry King: Were you a little disappointed in his debate performance? Larry King: He didn't try. Pat Boone: He missed the opportunity. He didn't prepare. And she, of course, did prepare. Because she's a thorough professional. The founding fathers did not have professional politicians in mind for our government. They wanted business people, lawyers, doctors, farmers to come in, represent the people for a while, then go back to their professions, and not settle down for 30, 40 years and become wealthy in congress. So, Trump is nobody- well, I say, nobody's favorite- there are millions of us who don't consider him the best candidate. But on the other hand, neither is the other. And so, we're all gonna vote. We're all gonna vote. Either for one candidate or the other, or in not voting, as some Republicans have said they're doing, they're voting for whoever wins. Larry King: And some Bernie Sanders people aren't going to vote either.